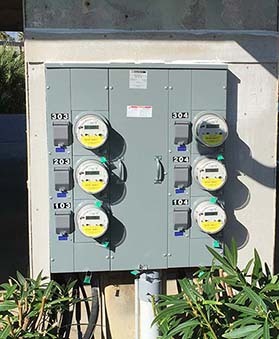 We recently completed a complete replacement of all meter centers at the Seascape Condominiums complex in Orange Beach, Alabama. This project included upgrading six six-gang meter centers. 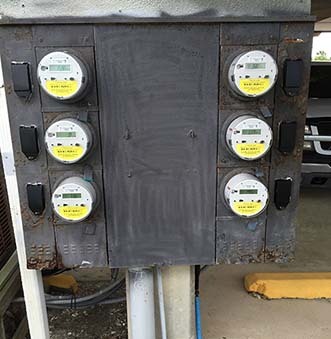 Example of old corroded meter center at Seascape Condominiums. New meterr center for years of solid clean power for condo units. of ignition and are responsible for 38 percent of the fatalities attributed to electrical fires. Older homes should have their electrical systems examined by a licensed electrician and every home should be examined at least once every 10 years. A licensed electrician can analyze the system to determine if additional capacity is required. According to Underwriters Laboratories over 30 million homes are at least 50 years old. The electrical systems in these homes were not designed for nor did electrical codes require that they handle the demands placed on them by today’s consumers. Talk to your electrician about installing Arc Fault Circuit Interrupters in your home. Unlike the Ground Fault Interrupters which protect the consumer from danger of shock, an AFCI detects dangerous electrical arcing and will shut down the circuit before a fire can ignite. The NFPA identified electrical arcing as the probable cause in 72 percent of the fires categorized as electrical. Buy electrical products from legitimate retailers and avoid products with no identifying marks. In recent years, the CPSC has recalled more than a million counterfeit electrical products. They account for 18 percent of the counterfeit items seized by U.S. Customs (second only to footwear). Counterfeit electrical items typically look like items certified for safety by labs like UL. They may even bear a counterfeit UL tag. Unfortunately, use of these items can result in shock, fire and electrocution. Seized items have included hair dryers, extension cords and power strips. Download this Home Safety Checklist from the CPSC website for recommended methods to promote electrical safety in your home. Don’t take chances with your safety. Information courtesy of the Electrical Safety Foundation International. As always, use caution when maintaining your home and know your limits. Consult a professional when necessary.